The Big Burt Bros. are two normal Burt Brothers who are magically transformed by Kamek into giants in Yoshi's Island DS. The Big Burt Bros. act just like regular Burt Brothers. The two hop on top of each other, then jump off. Yellow Yoshi must attack the Big Burt Bros. by throwing eggs at either one, hurting them both at the same time. After a few Yoshi Egg hits, the Big Burt Bros. are defeated in the same fashion as their larger relative, Burt the Bashful. 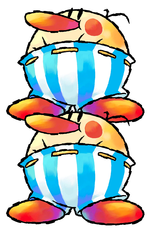 Biggu Donburi Burosu Big Donburi Bros.
Their artwork is simply a pair of Burt the Bashful's Yoshi's Island: Super Mario Advance 3 artwork. Much like him, their sprites depict them somewhat differently from their artwork, having a single curled hair instead of a pair of drooping hairs. This page was last edited on March 20, 2019, at 10:48.